Pickguard for Telecaster®, Black 1-ply (5 screw holes). Approximately 1.6 mm thick. 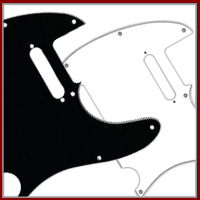 ..
Pickguard for Telecaster®, Black and Silver Paisley (5 screw holes) ..
Pickguard for Telecaster®, Black 1-ply (5 screw holes). Approximately 1.6 mm thick Left Hand ..
Pickguard for Telecaster®, Parchment 1-ply (5 screw holes). Approximately 1.6 mm thick. ..
Pickguard for Telecaster®, White 1-ply (5 screw holes). Approximately 1.6 mm thick. ..
Pickguard for Telecaster®, White 1-ply (5 screw holes). Approximately 1.6 mm thick Left Hand ..
Pickguard for Esquire®, Parchment (Old White) 1-ply (5 screw holes) ..
Pickguard for Telecaster®, Black 3-ply (with B/W) (8 screw holes) ..
Pickguard for Telecaster®, Cream Pearl 3-ply (8 screw holes) ..
Pickguard for Telecaster®, Mint Green 3-ply (8 screw holes) ..
Pickguard for Telecaster®, Parchment (Old White) 3-ply (8 screw holes) ..
Pickguard for Telecaster®, Red Pearl 3-ply (8 screw holes) ..
Pickguard for Telecaster®, Red Tortoise 3-ply (8 screw holes) ..
Pickguard for Telecaster®, Tortoise Brown 3-ply (8 screw holes) ..
Pickguard for Telecaster®, Vintage Cream 3-ply (8 screw holes) ..
Pickguard for Telecaster®, White 3-ply (with B/W) (8 screw holes) ..